Since its launch in 2009, the Google Dashboard has been a useful tool that helps users better manage their data and (relative) privacy. 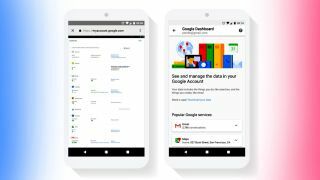 Eight years later, Google is announcing a major overhaul of Dashboard, making it easier to manage the products and services you use through Google, as well as how much data each is allowed to access. As seen in the image above comparing the old Google Dashboard (left) with the new one (right), the most noticeable difference is how touchscreen-friendly the refreshed design is compared to the original. With more users turning to mobile devices for their searches and apps, it also makes sense that managing your data on those devices should be better-suited for smaller screens. The redesign also make it easier to download data — useful for Google's Takeout feature, which allows users to copy or export all their Google data to an external source. This feature has led to over an exabyte of exported data since its launch in 2011, Google says, with more than a million exports made each month. Google's new Dashboard is expected to roll out to users over the coming days. Oh, and in case you were curious: one exabyte is equal to a billion gigabytes.